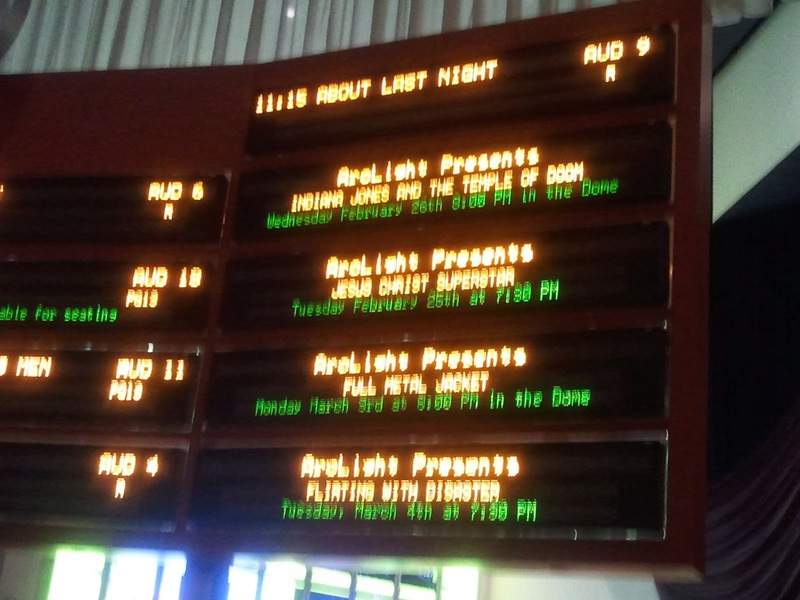 We went Tuesday to this screening at the Archlight Theater in Hollywood. The show was not quite sold out but it was quite full and everyone was very enthusiastic. Before the Q and A and the movie, the theater was filled with the sounds of Ted Neeley’s new music project and it sounded quite good. We arrived about half an hour before the show so we got to hear most of the album called “Rock Opera”. The Panel consisted of the promoter for the tour Frank Munoz, who acted as M.C. 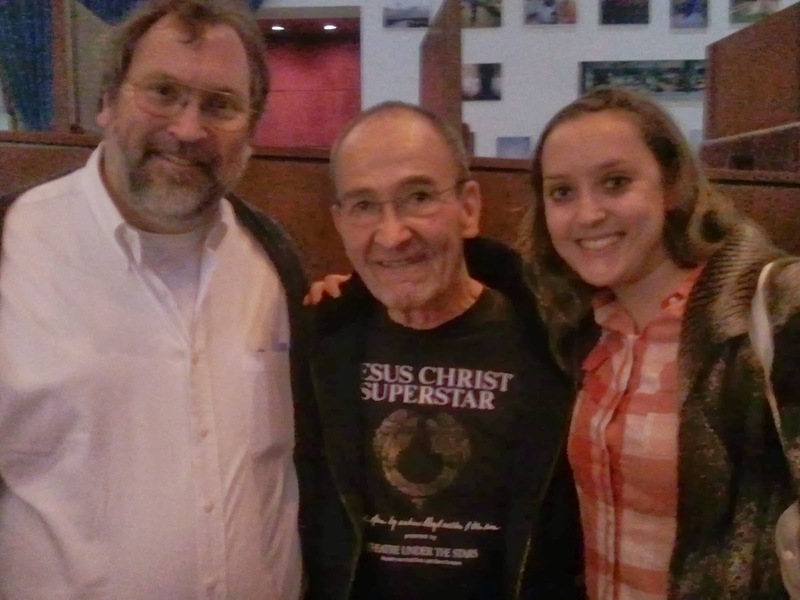 and interviewer, Ted Neely who played Christ in the movie, Barry Dennen who was Pontius Pilot, and Robert Iscove the choreographer who was essentially a second director on the film. Each of them shared some charming stories and some dramatic behind the scenes pieces of information. 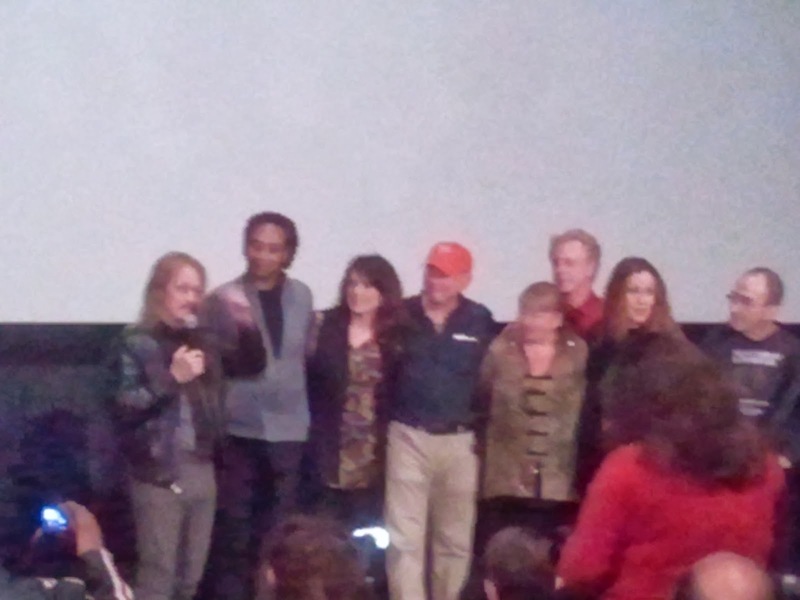 All of them spoke warmly of the late Carl Anderson, who fans know was Judas in the movie and had a terrific soul voice. 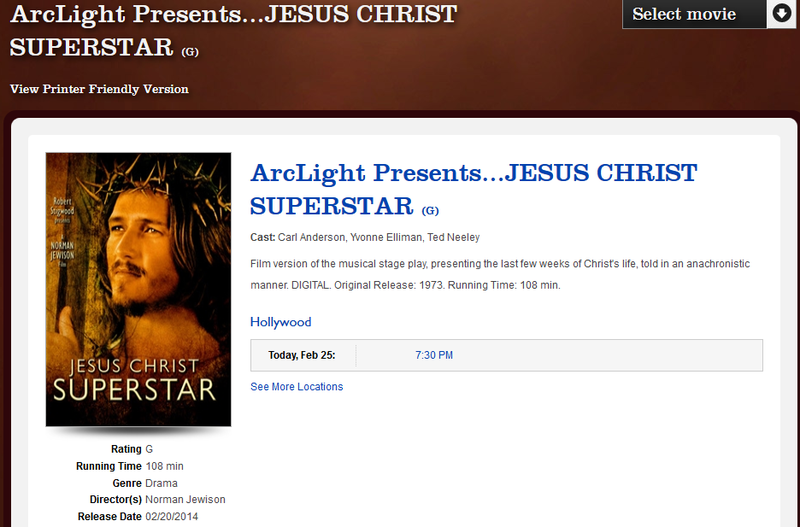 Jesus Christ Superstar is a phenomenon that many of the young people of today would not recognize. The idea started as a concept album, it was turned into a stage piece, than a touring Broadway show and finally it was adapted to the screen. Imagine a record without any pop stars on it, becoming a huge best seller and dominating the charts. Then try to visualize that being turned into a show. Basically, it started as a recording and everything else followed. I saw the staged version of the musical in a touring production of a Canadian Company at my high school auditorium. I suspect that this was one of the many unauthorized versions that were subsequently shut down by lawsuits around the world, they were playing before the Broadway show had even opened. After the Broadway run , Jesus Christ Superstar did a stand at the Universal Amphitheater in the open air. I did not get a chance to see it there but I remember television coverage of the event and I thought the show under the stars with the lights of the San Fernando Valley off to the side would have been wonderful. When the film opened in 1973, I did go to see it. I think my screening was at the old UA Theater on Colorado Blvd. but it is forty years ago now and I am not as sure of this as I am of other memories from the time. 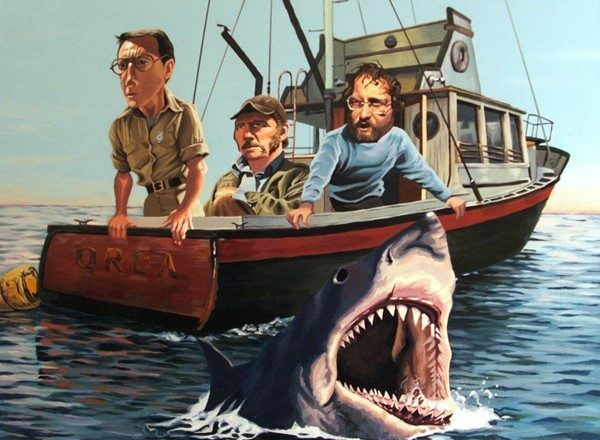 It was one of the films on the original “Movie A Day” project that got me started blogging in the first play. However I did not do that post. I was in Alaska for a week and my daughter Amanda covered it for me. You can find her original post here. As a kid, Amanda had a little cassette “Walkman” (remember those?) and I had recorded a copy of the movie soundtrack for her that she listened to incessantly. To this day she still rates Jesus Christ Superstar among her favorite movies. Of course we watch it every year along with other religious epics at Easter time. The touring version of the film is an amazing looking digital film with a spectacular sound mix. I was very impressed with the way the movie looked but especially the way it sounded. The little girl sitting next to me [the one who was eight or so and not my daughter , who had turned back into a little girl while we were watching] sang every song and hummed along with the music. She could not contain her enthusiasm and clapped out loud by herself several times. She was joined in applauding by the rest of the audience after some particularly great pieces. “Gethsemane” brings tears and it nearly brought the house down. During the Q and A, Frank and Ted asked if anyone in the audience had actually been in the movie. Only in Hollywood my friends, there were a half dozen dancers and background performers who had come out for the show. They all came down at the end for a group picture. One of them had played the apostle Matthew in the movie and several of “the women”, were also there. Each time one of them appeared on screen in the movie a whoop would go up and we could tell exactly which actress was there. After the show there was a merchandise table and I had the pleasure of being served by Wil Wheaton. I’m sure there is a connection there, but I don’t know what it is. I’m not usually a celebrity stalker but Josh Groban reached over my shoulder to shake hands with someone at the table at about the same time. Close Encounters of the Odd kind I guess. We did take a picture with Barry Dennan who was so fantastic in the movie and he was quite sweet to us as we greeted him. There was a long line to a meet and greet with Ted Neeley, after waiting about 45 minutes without much movement, we had to move on. It was still a great experience. 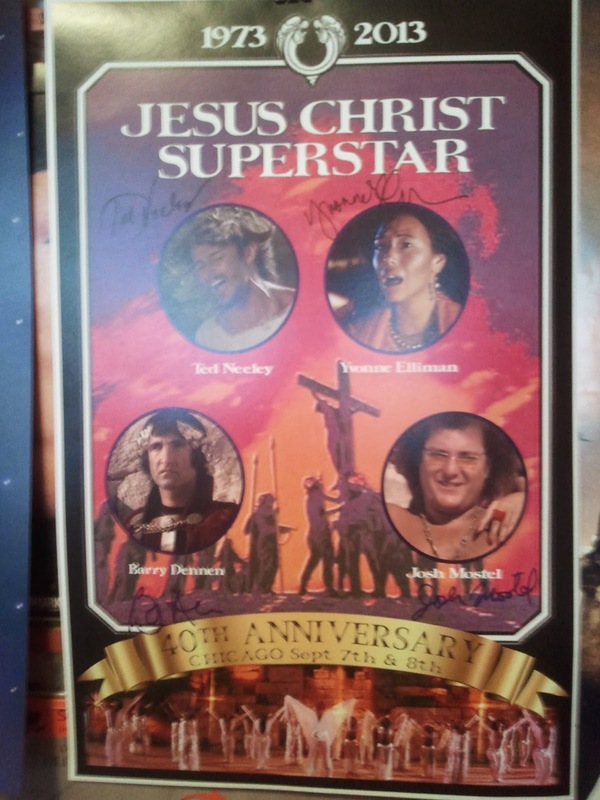 I don’t really collect autographs but I do collect posters and there was one for the film screen tour that was signed by Ted Neeley, Yvonne Elliman, Barry Dennan and Josh Mostel. I could not say no and I look forward to getting it framed. For now here is a little sneak peek.